HC AC/DC 400mm Chain Window Actuator constructed with a double-link chain made of stainless steel, Supplied with the bracket to mount the chain to the window. Our window actuators are available in a wide range of models and sizes. We have both chain and spindle actuators. 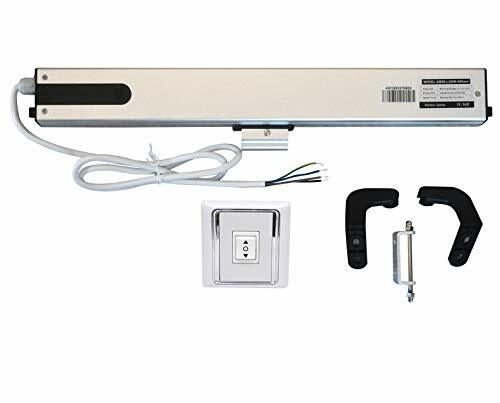 It can be operated by remote, timer, wall switch, and any other controller with dry type contacts Simple to fit, and all fitting included. - One wall switch and remote (optional for some models). Please check and confirm if you are not sure. Powered by feed-in 110V AC or 24V DC. Pressure capacity: 250N. Speed: 10mm/s. Fully open distance 40cm (16"). Adjustable between 10cm and 40 cm. Optionally wire into your existing automation system, via wall switch, or via wall switch and remote. If you have any questions about this product by SimpleSmart, contact us by completing and submitting the form below. If you are looking for a specif part number, please include it with your message.